POLITICIANS HAVE BEEN forbidden from canvassing for votes in Ireland’s asylum centres – even though thousands of residents are allowed to vote in the upcoming local elections. The management at the direct provision centres around the country have ruled that politicians are not allowed to talk to residents about their issues and concerns, or give them political leaflets. In a statement, the Department of Justice said that asylum accommodation centres are a “politically neutral environment”. One local election candidate in Cork had planned to canvas at a centre later this week but was firmly turned away when he rang ahead in advance. “They were polite but there was definitely no equivocation,” Donnchadh Ó Laoghaire of Sinn Féin told TheJournal.ie. “I gave my name and details and said I was looking to make arrangements to come up and canvas on Friday and they said no, absolutely not, they don’t have anyone in canvassing. “I said I didn’t think that was very fair, that these people are entitled to vote and they should have the opportunity to meet their candidates, but they [the management of the centre] said no politician is allowed in to canvas”. At least 152 people at the Kinsale Road centre in Cork are on the electoral register, Ó Laoghaire said. The centres are privately run by contractors, but are overseen by the Reception and Integration Agency which falls under the Department of Justice. Almost 5,000 people are being held in the so-called reception system for people looking to claim asylum in Ireland. The RIA referred requests for comments this evening to the Department Justice, who defended the policy. “Residents are, of course, entitled to their own political views and are free to communicate with political representatives,” a spokesperson for the Department told TheJournal.ie. But in the same way that Public Service offices operate in a politically neutral environment, so also must accommodation centres be free from any party political associations. The spokesperson said that party political leaflets, posters or circulars are not displayed or circulated in centres and that “politically orientated meetings” are not allowed to be held. 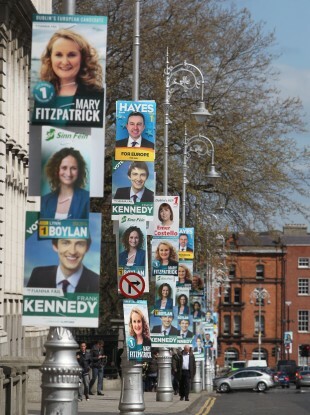 “These people [in the centres] see the posters but beyond that they know very little,” said Ó Laoghaire. “They don’t know what politicians’ policies are, there’s no opportunity to meet them and ask their positions”. “This is a very vulnerable category of people and they’re being further marginalised by not having access to candidates”. The direct provision system has been criticised by national and international groups in recent years for its approach to keeping asylum seekers in centres where they are not allowed to work. A recent ESRI report found a number of problems with the system, including overcrowding, lack of privacy, and insufficient facilities. Denise Charlton, the head of the Immigrant Council of Ireland, called for a review of the ban. Email “Politicians are not allowed to talk to people seeking asylum in Ireland”. Feedback on “Politicians are not allowed to talk to people seeking asylum in Ireland”.